Very light and tasty gluten free dessert perfect for the summer months. Preheat the oven to 100°C/gas mark ¼. Line a large baking sheet with non-stick baking paper. the mixer on high speed for 3 to 4 minutes. 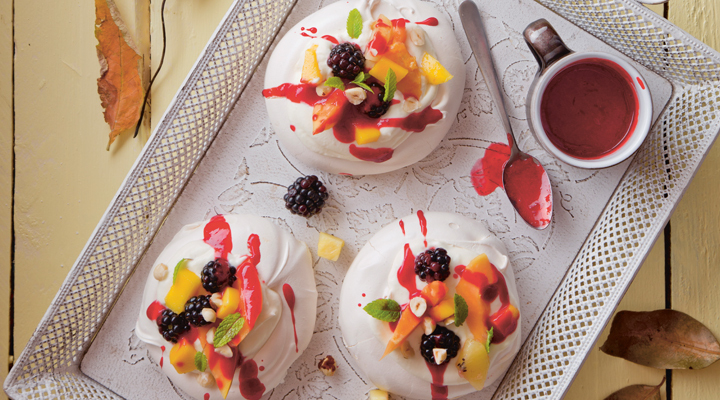 The biggest mistake people make is not mixing it enough, which means the pavlova won’t hold its shape. Put the cornflour and vinegar in a small bowl and mix to a paste. Add to the egg whites and mix well to fully combine. cream and fruit when baked. Bake in the oven for 80 minutes. Leave the pavlovas in the oven, but turn the oven off and leave the door open to allow the nests to dry out and cool completely. Meanwhile, to make the berry syrup, combine the sugar, lime juice and honey in a small saucepan set over a medium heat and stir until the sugar has dissolved. Bring to the boil, then add the berries and cook at a rapid boil for 1 minute. Remove from the heat and cool slightly. Transfer to a food processor and blend until smooth, then strain through a fine-mesh sieve. This will keep for several days in an airtight container in the fridge. For the Chantilly cream, put all the ingredients in a bowl and whisk together until soft peaks form. Chop the fruit into pieces about the size of a blackberry. the fresh mint just before serving.